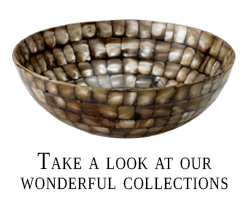 Frances Stoia Home offers an eclectic collection of home accents and gifts handmade from the finest natural elements such as horn, shells, bark, wood, bamboo, etc. Craftsmen from remote, exotic villages in the south seas implement our creative visions and sensibilities, integrating simplicity of form with function and practicality. Meticulous attention to quiet detail dramatizes the sculptural character of each object. The Frances Stoia Home Collection captures nature's beauty and sensuality in its most rare and precious forms.